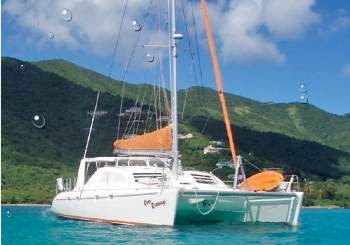 COOL RUNNINGS - Take 15% off the listed rates for charters confirmed by 15 April, 2012. Cool Runnings is a Leopard 45 catamaran, owned and run by David & Charlie Notley who provide a warm welcome aboard to all their guests. This catamaran has a great charter pedigree and is a former Cruising World Boat-of-the-year. She features four lavish queen-sized cabins each with en suite heads and showers, three of which are available for our charter guests. Cool Runnings is fully air-conditioned and for guests enjoyment, has CD, DVD and TV as well as plenty of games. Her tender is a 12-foot rib with an engine powerful enough to pull you or your guests around the bay. She also has a two-seater kayak and noodles and floaters for the less active guests. She has enough snorkels and fins for everybody and for the more adventurous. Scuba diving and windsurfing can always be arranged.